Dr. Shadley caring for a pregnant practice member using the Webster Technique. Chiropractic care during pregnancy and after delivery is vital to the normal physiological function of both the mother and the baby. Birth providers are recognizing the vast benefits associated with chiropractic care during pregnancy and the postpartum period. The Webster Technique is a specific chiropractic analysis and adjustment that aims to restore proper pelvic balance. During your pregnancy, your body is changing rapidly. Our goal is to help you maintain proper alignment so that your nervous system will function optimally, therefore allowing your baby to grow and develop properly without any interference. The Webster Technique aims to align the pelvis to ensure optimal fetal positioning as you approach labor and delivery. For moms-to-be, we have tables with an open supported abdominal section, so that you can be adjusted comfortably. We may also incorporate the use of pregnancy pillows, which allows you to lay on your belly to better aid in your relaxation. Many women find that seeking chiropractic care during pregnancy can lead to an easier birth, decreased labor times, and lowered rates of cesarean section, as well as less pelvic, hip and back pain. 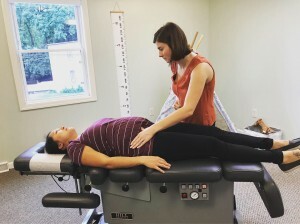 At Roots Chiropractic, we encourage all pregnant women to seek out Webster certified chiropractors to ensure they are receiving the best care during their pregnancies. Dr. Shadley is Webster Technique certified by the International Chiropractic Pediatric Association (ICPA) and her goal is to provide every pregnant woman with the highest quality care to ensure a healthy pregnancy. Dr. Shadley is also a certified BIRTHFIT Professional, and she enjoys empowering women to have the birth experience that they want, educating women about their birth options, as well as providing them with the tools to enjoy a healthy pregnancy and an easier postpartum recovery. Labor and delivery is a strenuous process, and your body will be going through rapid changes in that time. In the postpartum period, it is important to have your spine evaluated because your joints and ligaments have been stressed for so long, and now they will start to return to their former state. If your body isn’t properly aligned during this time, it can lead to joint pain and other symptoms that make taking care of your baby more challenging. If you’re planning on breastfeeding, this can often lead to a hunched posture which may result in neck, shoulder, and upper back pain. Once you bring your beautiful baby into the world and your body starts to heal, make sure to take care of yourself. We’re here to help you through the healing process! People often ask us how early in life babies can start being adjusted, and we always tell them the same thing: the day they’re born! Birth is the most traumatic event many of us will ever experience, and it’s important to have your baby’s spine checked to make sure their nervous system is functioning perfectly so that they can grow and develop properly. We often tell people who are concerned about the safety of adjusting their newborns that we use as much pressure as you would use to test the ripeness of a tomato. 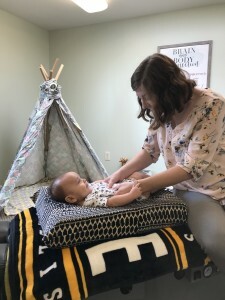 There is never any cracking or twisting when adjusting babies – we strive to provide gentle and specific care for our practice members, young and old. Dr. Shadley enjoys seeing babies & kids in the office to help promote proper growth and development. In children, chiropractic care can make a world of difference—reducing interference in the nervous system can address issues from ADHD to colic and ear infections. It has offered hope, help and progress to many families across the world. When it comes to adjusting children, Dr. Shadley and Dr. Tom do so with extreme care and the gentlest touch—they’re more than happy to show mom or dad exactly what the adjustment will feel like to the child. Every day in our office, we see babies as young as a day old, as well as toddlers, grade-school kids, and teenagers. Toddlers are constantly falling down and bumping into things, grade-school children are active and learning, and teenagers are venturing into the world of athletics – essentially, this means that they can all benefit from chiropractic care! Regular chiropractic care throughout childhood ensures that their nervous systems are able to adapt better to stressors in their everyday lives. Chiropractic is not just for pain – it’s for overall wellness and prevention of issues down the road!